Just after 10am this morning, twin blasts close to the central train station in Ankara exploded as people assembled for the start of a peace demonstration in the capital city. The authorities issued a statement two hours after the explosions indicating that 30 people had died and that 126 people were injured. Later in the afternoon, according to a statement by the Minister of Health, the death toll had risen to 86, with 186 people injured in the blasts. Amnesty International condemns the bombing, which appears to have targeted ordinary people exercising their right to demonstrate peacefully. Such attacks targeting civilians show contempt for the right to life and breach the most basic principles of international law. No individual or group has yet claimed responsibility for the attack. At 12 midday a mass “Labour, Peace and Democracy” demonstration with the support of a wide range of trade unions, professional bodies and civil society organizations was due to start. Media reports indicate that the bombing took place in an area where many people were holding banners of the Federation of Socialist Youth Associations (SGDF), Labour Party (EMEP) and Peoples’ Democracy Party (HDP), a Kurdish rooted leftist political party. Amnesty International calls on the Turkish authorities to conduct a prompt, impartial and thorough investigation and to bring all those responsible for the bombing to justice. The bombings come less than three months after a suicide bombing in the south eastern city of Suruç on Turkey’s border with Syria killed over 30 people. The Suruç bombing occurred just as SGDF activists began to make a press statement about their visit to deliver humanitarian assistance to the predominantly Kurdish city of Kobani across the border in Syria. 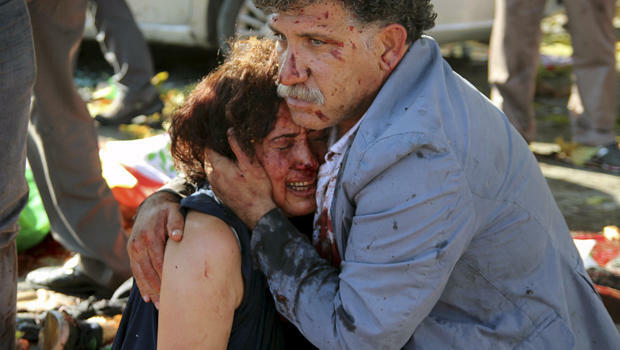 After the Suruç bombing, further violence erupted in Turkey with Kurdistan Workers’ Party (PKK) attacks on Turkish army soldiers and police and Turkish army attacks on PKK targets in Northern Iraq and Turkey shattering a faltering peace process that had commenced in March 2013. The Ankara bombing also comes ahead of snap elections called for 1 November following the June parliamentary elections in which no party gained a majority to form a government. A double bombing at a HDP election rally in the south eastern city of Diyarbakır two days before the June election killed four and left more than 400 injured. This entry was posted in Amnesty International, Freedom of Expression, PKK, Terrorism and tagged Amnesty Internatinal, Ankara bombing, HDP, Turkey. Bookmark the permalink.